Ilya Ilyich Mechnikov (Russian: Илья́ Ильи́ч Ме́чников, also written as Élie Metchnikoff; 15 May [O.S. 3 May] 1845 – 15 July 1916) was a Russian zoologist best known for his pioneering research in immunology. In particular, he is credited with the discovery of phagocytes (macrophages) in 1882. This discovery turned out to be the major defence mechanism in innate immunity. He and Paul Ehrlich were jointly awarded the 1908 Nobel Prize in Physiology or Medicine "in recognition of their work on immunity". He is also credited by some sources with coining the term gerontology in 1903, for the emerging study of aging and longevity. He established the concept of cell-mediated immunity, while Ehrlich established the concept of humoral immunity. Their works are regarded as the foundation of the science of immunology. In immunology, he is given an epithet the "father of natural immunity". Mechnikov was born in the village Ivanovka, Kharkov Governorate, now Dvorichna Raion, Ukraine. He was the youngest of five children of Ilya Ivanovich Mechnikov, a Russian officer of the Imperial Guard. His mother, Emilia Lvovna (Nevakhovich), the daughter of the Jewish writer Leo Nevakhovich, largely influenced him on his education, especially in science. The family name Mechnikov is a translation from Romanian, since his father was a descendant of the Chancellor Yuri Stefanovich, the grandson of Nicolae Milescu. The word "mech" is a Russian translation of the Romanian "spadă" (sword), which originated with Spătar. His elder brother Lev became a prominent geographer and sociologist. He entered Kharkiv Lycée in 1856 where he developed his interest in biology. Convinced by his mother to study natural sciences instead of medicine, in 1862 he tried to study biology at the University of Würzburg, but the German academic session would not start by the end of the year. So he enrolled at Kharkiv University for natural sciences, completing his four-year degree in two years. In 1864 he went to Germany to study marine fauna on the small North Sea island of Heligoland. He was advised by the botanist Ferdinand Cohn to work with Rudolf Leuckart at the University of Giessen. It was in Leuckart’s laboratory that he made his first scientific discovery of alternation of generations (sexual and asexual) in nematodes and then at Munich Academy. In 1865, while at Giessen, he discovered intracellular digestion in flatworm, and this study influenced his later works. Moving to Naples the next year he worked on a doctoral thesis on the embryonic development of the cuttle-fish Sepiola and the crustacean Nebalia. A cholera epidemic in the autumn of 1865 made him move to the University of Göttingen, where he worked briefly with W. M. Keferstein and Jakob Henle. In 1867 he returned to Russia to get his doctorate with Alexander Kovalevsky from the University of St. Petersburg. Together they won the Karl Ernst von Baer prize for their theses on the development of germ layers in invertebrate embryos. Mechnikov was appointed docent at the newly established Imperial Novorossiya University (now Odessa University). Only twenty-two years of age, he was younger than his students. After involving in a conflict with senior colleague over attending scientific meeting, in 1868 he transferred to the University of St. Petersburg, where he experienced a worse professional environment. In 1870 he returned to Odessa to take up the appointment of Titular Professor of Zoology and Comparative Anatomy. In 1882 he resigned from Odessa University due to political turmoils after the assassination of Alexander II. He went to Messina to set up his private laboratory. He returned to Odessa as director of an institute set up to carry out Louis Pasteur's vaccine against rabies, but due to some difficulties left in 1888 and went to Paris to seek Pasteur's advice. Pasteur gave him an appointment at the Pasteur Institute, where he remained for the rest of his life. Mechnikov became interested in the study of microbes, and especially the immune system. At Messina he discovered phagocytosis after experimenting on the larvae of starfish. In 1882 he first demonstrated the process when he pinned small thorns into starfish larvae, and he found unusual cells surrounding the thorns. The thorns were from a tangerine tree made into a Christmas tree. He realized that in animals which have blood, the white blood cells gather at the site of inflammation, and he hypothesised that this could be the process by which bacteria were attacked and killed by the white blood cells. He discussed his hypothesis with Carl Friedrich Wilhelm Claus, Professor of Zoology at the University of Vienna, who suggested to him the term "phagocyte" for a cell which can surround and kill pathogens. He delivered his findings at Odessa University in 1883. In 1887, he observed that leukocytes isolated from the blood of various animals were attracted towards certain bacteria. The first studies of leukocyte killing in the presence of specific antiserum were performed by Joseph Denys and Joseph Leclef, followed by Leon Marchand and Mennes between 1895 and 1898. Almoth E. Wright was the first to quantify this phenomenon and strongly advocated its potential therapeutic importance. The so-called resolution of the humoralist and cellularist positions by showing their respective roles in the setting of enhanced killing in the presence of opsonins was popularized by Wright after 1903, although Metchnikoff acknowledged the stimulatory capacity of sentisitized serum of phagotic function in the case of acquired immunity. This attraction was soon proposed to be due to soluble elements released by the bacteria (see Harris for a review of this area up to 1953). Some 85 years after this seminal observation, laboratory studies showed that these elements were low molecular weight (between 150 and 1500 Dalton (unit)s) N-formylated oligopeptides, including the most prominent member of this group, N-Formylmethionine-leucyl-phenylalanine, that are made by a variety of growing gram positive bacteria and gram negative bacteria. Mechnikov's early observation, then, was the foundation for studies that defined a critical mechanism by which bacteria attract leukocytes to initiate and direct the innate immune response of acute inflammation to sites of host invasion by pathogens. Mechnikov also developed a theory that aging is caused by toxic bacteria in the gut and that lactic acid could prolong life. Based on this theory, he drank sour milk every day. He wrote The Prolongation of Life: Optimistic Studies, in which he espoused the potential life-lengthening properties of lactic acid bacteria (Lactobacillus delbrueckii subsp. bulgaricus). He attributed the longevity of Bulgarian peasants to their yogurt consumption. Mechnikov died in 1916 in Paris from heart failure. According to his will, his body was used for medical research and afterwards cremated in Père Lachaise Cemetery crematorium. His cinerary urn has been placed in the Pasteur Institute library. He was greatly influenced by Charles Darwin's theory of evolution. He first read Fritz Müller's Für Darwin (For Darwin) in Giessen. From this he became a supporter of natural selection and Ernst Haeckel's biogenetic law. His scientific works and theories were inspired by Darwinism. Mechnikov with Alexander Kovalevsky won the Karl Ernst von Baer prize in 1867 based on their doctoral research. He shared the Nobel Prize in Physiology or Medicine in 1908 with Paul Ehrlich . He was awarded honorary degree from the University of Cambridge in Cambridge, UK, and the Copley Medal of the Royal Society in 1906. He was given honorary memberships in the Academy of Medicine in Paris and the Academy of Sciences and Medicine in St. Petersburg. The Leningrad Medical Institute of Hygiene and Sanitation, founded in 1911 was merged with Saint Petersburg State Medical Academy of Postgraduate Studies in 2011 to become the North-Western State Medical University named after I.I. Mechnikov. The Odessa I.I. Mechnikov National University is in Odessa, Ukraine. ^ Belkin, R.I. (1964). "Commentary," in I.I. Mechnikov, Academic Collection of Works, vol. 16. Moscow: Meditsina. p. 434. Belkin, a Russian science historian, explains why Metchnikoff himself, in his Nobel autobiography -- and subsequently, many other sources -- mistakenly cited his date of birth as May 16 instead of May 15. Metchnikoff made the mistake of adding 13 days to May 3, his Old-Style birthday, as was the convention in the 20th century. But since he had been born in the 19th century, only 12 days should have been added. ^ Vikhanski, Luba (2016). Immunity: How Elie Metchnikoff Changed the Course of Modern Medicine. Chicago Review Press. p. 278. ISBN 978-1613731109. The author cites Metchnikoff's death certificate, according to which he died on July 15, 1916 (the original is in the Archive of the Russian Academy of Sciences, Metchnikoff Fund, 584-2-208). Olga Metchnikoff did not provide a precise date for her husband's death in her book, and many sources erroneously cite it as July 16. ^ a b c d e f "Ilya Mechnikov - Biographical". Nobelprize.org. Nobel Media AB. Retrieved 16 March 2015. ^ a b "Élie Metchnikoff". Encyclopædia Britannica. Encyclopædia Britannica, Inc. Retrieved 16 March 2015. ^ a b "The Nobel Prize in Physiology or Medicine 1908". Nobelprize.org. Nobel Media AB. Retrieved 16 March 2015. ^ Vértes, L (1985). "The gerontologist Mechnikov". Orvosi hetilap. 126 (30): 1859–1860. PMID 3895124. ^ Martin, D. J.; Gillen, L. L. (2013). "Revisiting Gerontology's Scrapbook: From Metchnikoff to the Spectrum Model of Aging". The Gerontologist. 54 (1): 51–58. doi:10.1093/geront/gnt073. PMID 23893558. ^ Kaufmann, Stefan H E (2008). "Immunology's foundation: the 100-year anniversary of the Nobel Prize to Paul Ehrlich and Elie Metchnikoff". Nature Immunology. 9 (7): 705–712. doi:10.1038/ni0708-705. PMID 18563076. ^ a b c Gordon, Siamon (2008). "Elie Metchnikoff: Father of natural immunity". European Journal of Immunology. 38 (12): 3257–3264. doi:10.1002/eji.200838855. PMID 19039772. ^ a b c d "Metchnikoff, Elie". Dictionary of Scientific Biography. Retrieved 16 March 2015. ^ "Full text of "Life of Elie Metchnikoff, 1845-1916"". archive.org. ^ White, James D (1976). "Despotism and Anarchy: The Sociological Thought of L. I. Mechnikov". The Slavonic and East European Review. 54 (3): 395–411. JSTOR 4207300. ^ Metchnikoff E (1887). "Sur la lutte des cellules de l'organisme contre l'invasion des microbes". Ann. Inst. Pasteur. 1: 321. ^ Tauber& Cherniak (1991). Metchnikoff and the Origins of Immunology: From Metaphor to Theory. Oxford UK: Oxford University Press. p. 155. ISBN 0-19-506447-X. ^ Grawitz P (1887). "unknown". Virchows Adz. IIO. I. ^ Harris H (July 1954). "Role of chemotaxis in inflammation". Physiological Reviews. 34 (3): 529–62. PMID 13185754. ^ Ward PA, Lepow IH, Newman LJ (April 1968). "Bacterial factors chemotactic for polymorphonuclear leukocytes". The American Journal of Pathology. 52 (4): 725–36. PMC 2013377. PMID 4384494. ^ Schiffmann E, Showell HV, Corcoran BA, Ward PA, Smith E, Becker EL (June 1975). "The isolation and partial characterization of neutrophil chemotactic factors from Escherichia coli". Journal of Immunology. 114 (6): 1831–7. PMID 165239. ^ Mackowiak, Philip A. (2013). "Recycling Metchnikoff: Probiotics, the Intestinal Microbiome and the Quest for Long Life". Frontiers in Public Health. 1: 52. doi:10.3389/fpubh.2013.00052. PMC 3859987. PMID 24350221. ^ Podolsky, Scott H (2012). "Metchnikoff and the microbiome". The Lancet. 380 (9856): 1810–1811. doi:10.1016/S0140-6736(12)62018-2. PMID 23189332. ^ Brown, AC; Valiere, A (2004). "Probiotics and medical nutrition therapy". Nutrition in Clinical Care. 7 (2): 56–68. PMC 1482314. PMID 15481739. ^ B. I. Goldstein (21 July 1916). "Elie Metchnikoff". Canadian Jewish Chronicle. Retrieved 17 November 2012. ^ Tauber, Alfred I.; Chernyak, Leon (1991). Metchnikoff and the Origins of Immunology : From Metaphor to Theory: From Metaphor to Theory. New York (US): Oxford University Press. p. 5. ISBN 978-0-1953451-00. There is no clear record that he was professionally restricted in Russia because of his lineage, but he sympathized with the problem his Jewish colleagues suffered owing to Russian anti-Semitism; his personal religious commitment was to atheism, although he received strict Christian religious training at home. Metchnikoff's atheism smacked of religious fervor in the embrace of rationalism and science. We may fairly argue that Metchnikoff's religion was based on the belief that rational scientific discourse was the solution for human suffering. ^ a b "Ilya Ilyich Mechnikov (Elie Metchnikoff) (1845-1916)". The Embryo Project Encyclopedia. Retrieved 16 March 2015. ^ Thomas F., Glick (1988). The Comparative Reception of Darwinism. Chicago: University of Chicago Press. p. 244. ISBN 978-0-226-29977-8. ^ "North-Western State Medical University I.I. Mechnikov". FAIMER. Retrieved 17 March 2015. ^ "North-Western State Medical University named after I.I. Mechnikov". North-Western State Medical University named after I.I. Mechnikov. Retrieved 17 March 2015. ^ "Odessa I.I. Mechnikov national university". Odessa I.I. Mechnikov national university. Retrieved 17 March 2015. Breathnach, C S (September 1984). "Biographical sketches—No. 44. Metchnikoff". Irish Medical Journal. Ireland. 77 (9): 303. ISSN 0332-3102. PMID 6384135.
de Kruif, Paul (1996). Microbe Hunters. San Diego: A Harvest Book. ISBN 978-0-15602-777-9. Deutsch, Ronald M. (1977). The new nuts among the berries. Palo Alto, CA: Bull Pub. Co. ISBN 0-915950-08-1. Fokin, Sergei I. (2008). Russian scientists at the Naples zoological station, 1874 - 1934. Napoli: Giannini. ISBN 978-8-8743-1404-1. Gourko, Helena; Williamson, Donald I.; Tauber, Alfred I. (2000). The Evolutionary Biology Papers of Elie Metchnikoff. Dordrecht: Springer Netherlands. ISBN 978-94-015-9381-6. Karnovsky, M L (May 1981). "Metchnikoff in Messina: a century of studies on phagocytosis". N. Engl. J. Med. United States. 304 (19): 1178–80. doi:10.1056/NEJM198105073041923. ISSN 0028-4793. PMID 7012622. Lavrova, L N (September 1970). "[I. I. Mechnikov and the significance of his legacy for the development of Soviet science (on the 125th anniversary of his birth)]". Zh. Mikrobiol. Epidemiol. Immunobiol. USSR. 47 (9): 3–5. ISSN 0372-9311. PMID 4932822. Metchnikoff, Olga (2014) . Life of Elie Metchnikoff 1845-1916. The Floating Press. ISBN 978-1-7-76534-93-7. Schmalstieg Frank C, Goldman Armond S (2008). 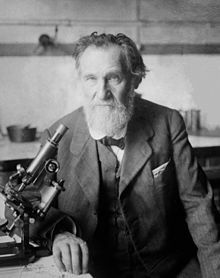 "Ilya Ilich Metchnikoff (1845–1915) and Paul Ehrlich (1854–1915) The centennial of the 1908 Nobel Prize in Physiology or Medicine". Journal of Medical Biography. 16 (2): 96–103. doi:10.1258/jmb.2008.008006. PMID 18463079. Tauber AI (2003). "Metchnikoff and the phagocytosis theory". Nature Reviews Molecular Cell Biology. 4 (11): 897–901. doi:10.1038/nrm1244. PMID 14625539. Tauber, Alfred I.; Chernyak, Leon (1991). Metchnikoff and the Origins of Immunology: From Metaphor to Theory. New York: Oxford University Press. ISBN 978-0-19-534510-0. Zalkind, Semyon (2001) . Ilya Mechnikov: His Life and Work. The Minerva Group, Inc. ISBN 0-89875-622-7. Wikimedia Commons has media related to Élie Metchnikoff. Elie Metchnikoff, Nobel Luminaries - Jewish Nobel Prize Winners, on the Beit Hatfutsot-The Museum of the Jewish People Website.